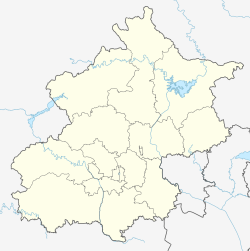 Gubeikou (Chinese: 古北口; pinyin: Gǔběikǒu; literally: 'old north gate') is a town of Miyun District in northeastern Beijing, bordering with Luanping County, Hebei to the north and the Beijing towns of Gaoling (高岭镇) to the west, Xinchengzi (新城子镇) to the east and Taishitun (太师屯镇). The area is one of the important passes of the Great Wall of China, serving as an ancient chokepoint for travelers between the Northeast and Beijing. As of 2011[update], it had 4 residential communities (社区) and 9 villages under its administration. ^ 2011年统计用区划代码和城乡划分代码：密云县 (in Chinese). National Bureau of Statistics of the People's Republic of China. Retrieved 2013-01-08. ^ 2011年统计用区划代码和城乡划分代码：古北口镇 (in Chinese). National Bureau of Statistics of the People's Republic of China. Retrieved 2013-01-08. This page was last edited on 6 August 2018, at 23:01 (UTC).